Obsessing over certainty and worrying about achieving 100% error-free output can foster overthinking. And overthinking, in turn, prevents us from taking real action, blindsiding us against seeing the obvious when making decisions. 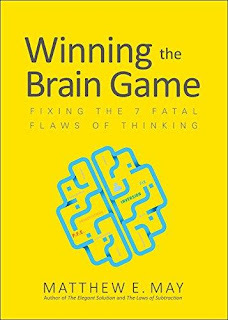 Escaping this erroneous pattern of thought and many more are the themes of Mathew E. May's book, Winning The Brain Game: Fixing The 7 Fatal Flaws Of Thinking. I remember vividly my daughter as an infant in her high chair dropping food on the floor. She was a perfect little learner, wondering what would happen if she could somehow get her strained carrots on the floor. I’m certain that the problem was somehow framed quite clearly to her— how do I get them on the ground? —perhaps not in words, for she could not yet talk. Tracking her eye movements, I watched her consider several hypotheses: she could tip her entire bowl over the tray, she could fill her spoon and flick away, or simply grab a fistful and fling—three viable ways to answer the question. Now the fun begins. She decides quickly to try the bowl- tip method, and runs her test. Her success metric is obvious: food on the floor. Her test works wonderfully well. In fact, the feedback exceeds her expectations: the noise from her dish as it crashes on the tile gives her great glee, food is everywhere, and Mom gets really busy. Yay! So fun!! It works so well she adopts it as her tentative best practice. As Mom cleans up and replaces a full bowl of food on the tray, she does what any good scientist does, and confirms her results. This time, however, the feedback is a bit different, and not as positive as the initial trial: Mom isn’t happy about it, and Dad has to get involved. Lesson learned. So she launches another experiment, this time with the spoon method. Without any help or guidance, my daughter was learning just fine on her own, in the most powerful way: satisfying her natural curiosity through rapid experimentation. In this type of learning, the test came before the lesson. There was no sense of failure, for it was a concept yet to be introduced. Without a sense of failure, she was fearless in her learning and experimenting. It would not be long before it would disappear. Once in the classroom, her fearless learning through testing was replaced by a new kind of learning. Her teachers now asked the questions, and she had to answer correctly. the need to be certain and correct grew. In a complete reversal of her toddler learning, she faced a new kind of test, one that came after the lesson. There was a right and wrong answer involved with this kind of test, and a grade called 'F', for failure. Along with grades on tests came fear. At the root of overthinking is fear. And with this fear comes the fixation of making fewer errors, thus reverting to easy patterns of thinking, focusing on what has worked before and reluctance to take risks. In the long run, this cripples creativity in individuals and foster timidity of thought in organisations. Winning The Brain Game takes a comprehensive look at why we think the way we do and how to reset our brains to look at situations from a neutral point of view in place of lazy or biased perspectives. Winning The Brain Game can be a bit difficult to read in parts. However, its real-life examples and illustrations help put its point across. If you don't like complex theories with long analogies, this might not be the book for you. But if you are willing to stick it out, the reward can be great. I recommend this book to those seeking change in the way they think about life and problems. Many thanks to McGraw-Hill Education for review copy.